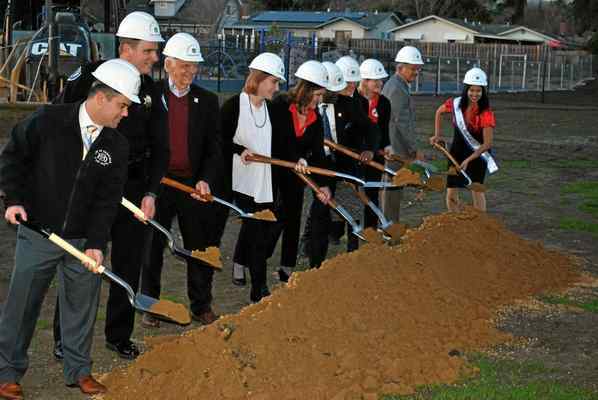 PHOTO BY RICHARD BAMMER — THE REPORTER Shovels in hand, school and district leaders, elected officials, including Fairfield Mayor Harry Price (third from left), and others toss soil Tuesday evening to symbolize groundbreaking for the new library and gymnasium, a $19.4 million project, at the Fairfield-Suisun Public Safety Academy campus on Atlantic Avenue in Fairfield. symbolize groundbreaking for the new library and gymnasium at the Fairfield-Suisun Public Safety Academy, $19.4 million in building projects that will be ready to open in December. In opening remarks before the groundbreaking ceremony, Superintendent Kris Corey, speaking as the sun set behind her, just yards away from the 2-story library site, acknowledged the project “will affect the neighborhood,” which includes homes along Larkspur Lane, Orchid Street and Atlantic. But, she added, neighbors appear to be supportive of the coming construction project, which will be directed by Landmark Construction, a general contractor based in Loomis. 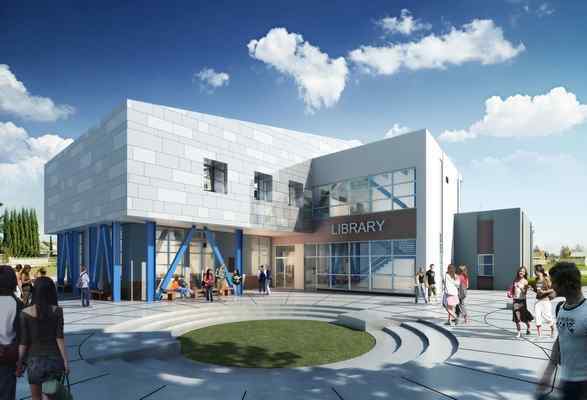 An architectural rendering of the new 2-story library planned for the Fairfield-Suisun Public Safety Academy in Fairfield. Governing board President David Isom, in his remarks, said, “Yeah, for Measure J!” a reference to the $249 million bond passed by voters in June 2016, from which the project’s costs will be tapped. “We are creating schools of choice within the public school system,” added Isom, by day pastor of the St. Stephen CME Church in Fairfield, alluding to a demand from some district parents to offer either charter, alternative or specialized education programs for their children. As school leader, she oversees an enrollment of more than 710 students in grades five to 12 and nearly 30 teachers. A campus originally built in 1965, when it served as Amy Blanc Elementary, PSA, as it’s called for short, is designed to provide a rigorous academic program and career readiness for those students interested in law enforcement, fire fighting, emergency response, and other public safety-related fields. Corey said the new gymnasium, which will include a fitness center, will be next to Atlantic Avenue. The project will be financed through a “lease-leaseback” arrangement, she noted. In recent years among some California school districts, lease-leaseback arrangements, which avoid open bidding and contracts directly with favored companies, have proven to be controversial because it is a practice, critics contended, that was unfair and possibly illegal. In response to critics, some school district leaders said lease-leasebacks allow them to choose companies that have a good reputation for quality work or a strong track record on similar projects, rather than simply picking the lowest bidder. The legal issue, however, appears to be settled, for now. The 14,500-square-foot gym and fitness room will feature a sizable ceiling fan system that efficiently circulates air, keeping air-conditioning costs very low, said Tim Goree, a spokesman for the district. The library, which comes in at 11,000 square feet, boasts a “purposeful lack of built-in furniture structures to maximize the flexibility of building use — nearly all furniture and shelving will be moveable,” he noted in an email to The Reporter. New to the buildings will be buckling-restrained braces, designed to allow the building to better withstand earthquakes than traditional concentrically braced buildings, with lower overall projects costs, Goree said. The project is one of the first for school buildings in California, he pointed out. In an interview Wednesday, Halcomb said the new library “will add a great deal to our instructional program, to include so-called “maker spaces,” where students can engage in project-based learning and career technical education. As for the gym, she said, “It’s one thing I’m really looking forward to,” a space that can be used — when not used by students — by community groups and for large gatherings that could not be held in the school’s existing multipurpose room.